The African Penguin, who is found only in Africa, is also known as Jackass Penguin and the Blackfooted Penguin. African Penguins prefer habitats where water temperatures are cold and full of nutrients because most of their time is spent in the waters off shore. They only come onshore when they breed, rest and molt. Unfortunately there are many threats facing the African Penguin. What was at one time a plentiful species is now endangered and moving quickly toward extinction. Below is a list of interesting information and unique characteristics about this bird, including why they have become endangered. Both adults and kids will find these facts informative. With a height of about 2 feet (60 centimeters) tall and a weight of no more than 8 lbs (3.6 kg), the African Penguin is considered a medium sized bird. With a white belly, black wings and back, and a black and white face, the most easily identifiable characteristic of this bird is its black and white coloration. 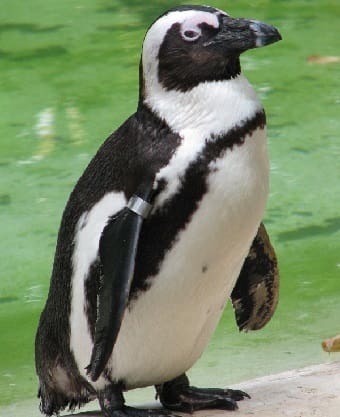 Webbed feet, wings that function like flippers, short tails and water-proof feathers help the African Penguin dive to depths of 427 feet (130 meters) below the surface of the water and and swim at speeds of up to 12 miles per hour (20 km/h). The African Penguin can considerably reduce its heart rate, allowing it to hunt underwater for over two minutes before coming up for air. The average life expectancy of an African Penguin in the wild is about 10 years. The African Penguins live in colonies on a total of 24 different islands off of Africa. They can also be found off the coast of Africa between Namibia and Port Elizabeth. Guano is the name for the burrow that the African Penguins build out of their own feces. Oil spills, commercial fishing, natural predators, less nesting space, and lack of nesting material all contribute to the dramatic decline in the African Penguin population. In the last 30 year, the population of African Penguins has seen a steep decline of approximately 50%. While all of the threats are contribute to this bird being endangered, oil spills and the after effects are the main reasons for its decline. Oil spills not only poison the birds body if swallowed, but the outside of their body becomes virtually useless to them. The oil prevents their feathers from working and ultimately results in hypothermia. If the birds are not cleaned within a few days, they will ultimately die. Commercial fishing has resulted in less fish for the penguins which is their main food source. They prefer to eat anchovies, sardines, mackerel and herrings but will also eat various types of shellfish and squid. The African Penguins eggs are also collected for food which greatly reduces the number of births. Although most of the decline in population is a direct result of human impact, there are environmental factors that contribute as well. The population of sardines and anchovies has naturally shifted to the east, leaving them with less food. So far, the best effort to reverse the damage already done has been to keep marine protected areas off limits to commercial fishing. Removal of the nesting material, guano, for fertilizer has forced the birds to change their nesting habits.